The threat of being taken over by a corporate entity is a relatively new—but increasingly real—concern in radiology. Corporate-owned outpatient imaging centers are directly competing with traditional practices for patient referrals and have gained considerable market share by promoting greater patient comfort, convenience, and procedure turnaround times. In a period of reduced reimbursement, their size and economies of scale can make them tough competition. But an even greater threat to traditional radiology groups is the growth of teleradiology and remote reads—and the resulting increased competition. To be successful in this changing climate, it is more critical than ever that radiologists adopt an entrepreneurial attitude. Adapting to the current and future challenges will require radiologists to think about their groups in terms of generating more value for their customers to create a competitive advantage in the marketplace. The most important tool in radiologists’ tool chest is the ability to show their consultative value to referring physicians, patients, and hospital administrators. A well-conceived and properly managed teleradiology strategy can add new muscle to a hospital-based practice by lightening the on-call load, adding a wider range of subspecialty expertise, and improving customer service to both referring physicians and hospitals. Without a strong, underlying relationship with these two customers, radiology groups risk devaluing their services and importance. This opens the door for corporate-run entities to step in and promise more for less. That promise will provide a tempting option for hospitals and referring physicians alike, perhaps regardless of the ability to actually deliver improvements. The elements of teleradiology that originally appealed to hospital-based radiologists—including on-demand “surge” capacity, 24/7 access, subspecialty reads, and the resulting reduced staffing costs—are also attractive to hospitals. As a result, teleradiology’s growth increases the risk that some hospitals may eventually decide to bypass traditional practices and shift some or all of their radiology needs to companies founded on the basis of the technological benefits of teleradiology. As we’ve seen in a modest but increasing number of hospitals, even radiology groups that had built solid relationships with their hospitals and maintained excellent performance are not exempt. With a simple change in hospital administration or the attitude of some radiology group members toward the hospital, takeovers—sometimes termed “displacements”—can occur with little warning. Groups that had been reading with their hospital partners for decades have been replaced. Radiology practices can fall prey to companies that cut deals with hospitals that look too lucrative for those hospitals to ignore. The choice target for such a takeover is the entire hospital contract. While some teleradiology companies have been trying to expand their daytime market, many have discovered there is little profit to be found in contracts with small imaging centers, mobile ultrasound, and mobile X-ray. The entire hospital contract offers both greater volume and higher-end services such as CT and MRI. Companies founded on teleradiology technologies still need to incorporate some type of hybrid business model utilizing on-site radiologists at a hospital—at the very least for interventional radiology—sometimes with some on-site diagnostic radiologists to be the face of the department. In these situations, teleradiology is not just for night interpretations but teleradiology is instead deployed as a full-blown adjunct to the on-site staff. As a result of the changes in the competitive landscape in radiology, many groups are more willing to work with their hospital partners, offering more flexibility and focus on providing great service at their facility and going above and beyond to ensure that everyone is happy. However, the realities of running a successful practice are infinitely more complex than in decades past. Virtually every group must provide overnight on-call duties. Does it make more sense economically or politically to outsource overnight responsibilities and devise an equitable and efficient way to handle those duties within the group? Bringing in teleradiology used to be seen as a boon to radiologists’ working lives, helping maintain a lifestyle and quality of care by preventing them from working nights and then days or switching between shifts. In recent years, bringing in teleradiology help is increasingly seen as introducing a competitor to hospital administration. How should a group answer this question? Generally speaking, groups of 20 or more physicians are probably better off spreading on-call duties internally and avoiding the risks of outsourcing teleradiology. Smaller groups probably need teleradiology support for physicians’ quality-of-life benefits and for cost reductions realized by not hiring additional radiologists. While the radiologist market is pretty tight right now, groups that are hiring generally find it easier to recruit if they offer limited call duties. Groups that elect to use a teleradiology service must closely scrutinize the potential ramifications on their business, just as you would scrutinize any potential vendor relationship. Do exam volumes justify the service or would the practice be best served covering with existing or new staff members? How will recruiting be impacted? Could this negatively impact the relationships with referring physicians or the hospital administration? Hospital-based groups considering incorporating teleradiology into their practice model should take time to fully understand the service offering and carefully weigh whether, and to what extent, remote reading makes sense for them. Harnessed correctly, teleradiology can generate big benefits for practices, including improved service to patients and hospitals and stronger physician recruiting through reduced on-call demands. Handled incorrectly, the group could find itself with no customers. From a strategic standpoint, the most important factor to consider when contemplating an outsourced teleradiology arrangement is your group’s existing relationship with the hospital. Practices that maintain strong ties with the hospital and are working toward mutually agreed-upon goals should have little to fear from teleradiology companies. Conversely, those that are seen as aloof and unapproachable, uncooperative, greedy, or just plain lacking in customer service may want to think twice about bringing a new and capable player into the mix. The traditional radiology group and the hospital or facility should share core strengths and values. Aligning overall goals and being willing to work cooperatively with the hospital and its staff to meet their goals is critical to long-term success. Enlisting a teleradiology firm can backfire if groups are on shaky ground with their hospitals or have, for whatever reasons, consistently failed to meet customer service expectations. Groups that open the door to a teleradiology provider before dealing with internal or relationship issues essentially are introducing an agile and aggressive competitor to their most important customer. Teleradiology firms continue to refine their customer service functions. Many are fast, capable, and thorough, and many offer timely interaction between the reading radiologist and the referring physician. Groups that cannot provide an equivalent level of service may be setting in motion their own demise by partnering with such a company. The larger corporate entities have adopted the latest technologies as the foundation of their business models. If your group decides to utilize an outside service for any form of coverage, it is critically important that the group control the contract and establish in writing that the firm will not negotiate directly with the hospital. Enlisting the teleradiology provider as a subcontractor can greatly reduce the possibility that the firm will make an end run around the practice to win a bigger share of the hospital’s business. It also allows the group to control the hours of service and type of coverage provided by the service. Whatever your view of these large teleradiology-based groups, independent radiology groups must look at where they fit with large national companies. 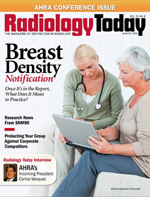 Stronger, forward-thinking groups willing to adapt have the best chance to move forward as radiology evolves. To some extent, that will mean embracing some of the same technologies being utilized by the larger companies. They will go beyond their traditional comfort levels to keep their place in the market and never forget to focus on their role as a valued consultant.